Receive immediate notification by email whenever a new camp has been added. Never miss out on a opportunity again! Sign up for our mailing list now so you will be notified as soon as registration for the camps opens in early February 2019. Academies for Young Minds camps encourage children to be innovative and use creative problem-solving by engaging them in fun, hands-on activities. Multiple camps are planned for the spring and summer of 2019 — both full-day and half-day in duration. For half-day camps, students can choose to attend either a morning or afternoon session or two different camps on the same day. Please be sure to check the grade levels associated with each camp, since not all camps are available for all grade levels. Please be sure to read the General Information section at the bottom of this page. 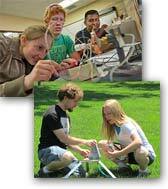 Registration for Academies for Young Minds Summer Camps is open now! Pam Batton is an interpretive educator with more than a decade of experience in biology and cultural history. She founded EcoAdventures in 1994, her fulfillment of her dream to connect people and nature in an unforgettable learning environment. It began with kindergarten and CSM teacher recertification courses. During the school year she's busy as an outreach program specialist to school districts around the state. Summer provides a wonderful opportunity for her to create unique summer camp programs that are unforgettable in depth and hands-on adventures. Pam has worked for nature centers, Jefferson County Open Space, Denver Museum of Nature and Science, Division of Wildlife, and Colorado State Parks. Explore the natural history of Colorado's large predators. On wild felines day you'll set up territory like a mountain lion and see if you can defend it. Wild canines day will have you howling as you try to pounce on a mouse to catch food fox style. Test your sense of smell against that of a bear. Will you be able to follow a trail with your nose? Come play wildlife games, touch specimens, and make a lynx mask. See if you can catch quick witted snacks during each class. Also learn what to do if you should ever meet one of these animals. Trey Corkern has been teaching history for 15 years. He has been a park ranger in North Dakota, a backpacking guide in New Mexico, a historic farmer in Colorado, and a museum curator in Wyoming. He is passionate about sharing his love of history with others. How hard is it to break down a castle wall? Make and fire catapults (used by the Romans), a ballista (the dart thrower that brought down Smaug in the Hobbit movie), and trebuchets. Look at the ancient designers (like Leonardo da Vinci) who decided to build a better siege weapon, then test your creations against class-mates in a pitched marshmallow battle! Every day will feature make and take-home crafts, including functioning mini-catapults and ballistas. Dr. Robert Knecht, CSM Emeritus Professor of Engineering Design, focuses his academic time on developing curricula for STEM/STEAM programs. Although his activities emphasize advising and coaching teachers and mentors, he brings his passion for teaching to his summer camps in the greater Denver area. He served for several years as Director for Design (EPICS), where he developed the project-based engineering design curriculum incorporating projects from industry. His experience as an engineer and designer for various engineering companies created the opportunity to hone his knowledge of the engineering design process, computational modeling, and economic evaluation. Have you ever wanted to build a working robot? Come to this camp to do just that! If you build a robot you have nothing more than a sculpture, but if you make it perform a function, you create a working robot capable of performing a series of fun-filled challenges. Add sensors to avoid objects and motor control to improve the movement of the robot to improve your robot's performance after each challenge. Work in teams to successfully create a working robot and to achieve recognitions as a master Lego operator. The Golden Gate Bridge Design Project provides teams an opportunity to explore a classic engineering project — building a bridge. The emphasis of the project explores engineering design and the interfaces with science, mathematics, technology, and art. You will design and construct a model of a creative bridge to support a maximum load applied to the center of the bridge deck within time and resource constraints. This project provides a fun learning environment to encourage you to explore a STEAM career. Tiffany is a STEM (Science, Technology, Engineering & Math) education specialist, consultant and blogger. Her background and interests are in biology and informal education (think museums, zoos, nature centers, etc.). That said, she is a learner at heart and loves to stretch herself and grow. Tiffany was considering a career in primatology when she started her science education career as an environmental education Peace Corps volunteer in Bolivia. She still enjoys a day trip to the primate house at the zoo and is an avid viewer of ape documentaries, but education captured her true passion. She expanded her science repertoire as an educator "Jack of all trades" at the Denver Museum of Nature and Science for the better part of a decade. Currently, Tiffany runs her own STEM education and consulting business. She has worked on various projects with organizations such as the Denver Zoo and the New York Academy of Sciences. Most recently, she has tackled physics education projects such as writing teacher guides for science education products for American Scientific, LLC, and developing curricula to accompany audio and video media produced by Inside Energy, a collaborative journalism initiative supported by the Corporation for Public Broadcasting. Tiffany is passionate about helping the public to understand the nature of science as a way exploring and understanding the world. She has also recently fallen in love with the concept of Design Thinking as a method of real-world problem solving. She believes that there is a little bit of scientist and inventor in all of us and thrills in guiding others through their own "why's" and "ah-ha" moments. That's probably how she became an educator in the first place… despite the call of the monkeys. This camp, with identical content, is also offered at a later date; see below. Have you ever dreamed of being an inventor? How about a toy inventor? Join us as we explore and experiment with different types of energy to figure out why it matters to the things YOU care about: toys and fun! Apply your new understanding of energy and other physics concepts as you practice the engineering design process to invent your very own toys. A final toy design challenge will culminate with a symposium where you can show off your inventions to your family. Prerequisites: a curious mind and a lively imagination. Future innovators, artists, scientists, inventors, engineers, tech-geeks, and problem-solvers: this workshop is for you! Have you ever noticed that the world is full of messy problems just waiting to be solved? Are you tired of waiting for adults to provide all the solutions? Contribute your own creativity and problem-solving skills as you use design thinking and the principles of scientific research to develop innovative solutions to real-world challenges. Join us as we come up with tomorrow's great ideas… today! Native people of the artic, Inuit-Yupik, knew how to find warmth, food, and shelter in a frozen land of snow and ice. Try out the life of a Yup'ik hunter/gatherer as you try to harvest food with bolas and atlatls. Make a miniature kayak to take home. Build a semi-subterranean shelter and try on traditional clothing. Learn how to tell a tale with a story knife and make one of your own. How did a mountain man named Hugh Glass survive a bear mauling to crawl 200 miles without equipment? Learn the mountain man's arts of survival in the American 1800's. Learn to build fires without matches, build shelters without nylon, find north without a compass, and practice first aid without a kit. Everyday you will make a survival object to take home. This camp, with identical content, is also offered at an earlier date; see above. Erika Remy studied chemistry at Oberlin College and has since worked at the Museum of Science and Technology in Syracuse, NY. Currently she is working at Aquahydrex on hydrogen electrolysis for renewable energy. She enjoys the experimental side of chemistry and hands on learning. Get an introduction to how the world works through chemistry. Launch mini rockets with household ingredients. Explore the sticky and slimy world of polymers. Learn why some things are sour, slippery or colorful. Find out how energy can speed things up and how we can slow them down again. In true scientific spirit experiments are all designed to be repeatable at home, using everyday ingredients. Find out just how colorful and silly science can be! How do you feel about leeches, bone saws, and un-anaesthetized surgery? Use historical and reproduction medical instruments to remove bullets from flesh, suture wounds, make and take home an 1800's medical kit, and learn the fine art of amputation. Learn some modern first aid skills. Feeling sick has never been this fun! Does it go bump in the night? Does it raise the hair on your neck or have a blood curdling scream? Many creatures are active at night and their behaviors are specialized for getting around in the dark. See if you can navigate in the dark like an owl or capture food like a bat. Will you be able to find food with only your nose to guide you? Find out how owls, bats, raccoons, tarantulas, woodrats, jackrabbits, toads, and others are able to navigate at night without going bump in the dark. Touch a live tarantula, play animal games and make a glow in the dark raccoon mask. How brutal can science and engineering be? We will use Easter "peeps" to learn the possible effects of gravity, acid, buoyancy, electricity, heat, and other stimuli upon simulated life forms and building materials. This camp will be a sugar buzzed outing into basic laboratory methods that include framing a prediction, making a hypothesis, executing an experiment, refining the experiment, and recording results. Do not expect to take many crafts home in this camp: although no living organisms will be used in this program, few of our candy experimental "test subjects" will survive. You have been warned! Change on earth can be violent and also amazing. Explore creation by volcano; destruction by earthquakes; habitat change by wildfire; and the power of tornados and floods. Build simulations and create your own natural disasters! Learn how these natural events work and how they change the earth. Register for any of the camps/sessions listed above and charge the full registration fee to your credit card online. Registration is limited to the first of the number listed for any camp/session. If a camp/session has filled, you can place your name on the waiting list for the camp/session. Click this button to register for any of the camps. For those who attend a morning session and an afternoon session on the same day, a supervised lunch hour (12:00pm until 1:00pm) is provided; however, students must bring their own sack lunch. Camp participants must be picked up no later than 15 minutes after the end of the last session for which they are enrolled on each day of the camp. Late pickups will result in a charge of $20.00 for each occurrence. To participate in the summer 2019 camps, students must be entering the grades indicated for each camp in the fall of 2019. On-campus lodging is not available. Click here for a list of accommodations in the area.